Plenty of Night Life. Assuredly there is night life in abundance. It is quite a town in one way and another; his bridgehead of the Rhine, now held by the American army. It was once highly esteemed by the Kaiser and his family. In the restaurant of the Riesen-Fuerstenhof Hotel, on the river front, of which hotel Herr Hohanson is proprietor, the orchestra leader displayed much astuteness. 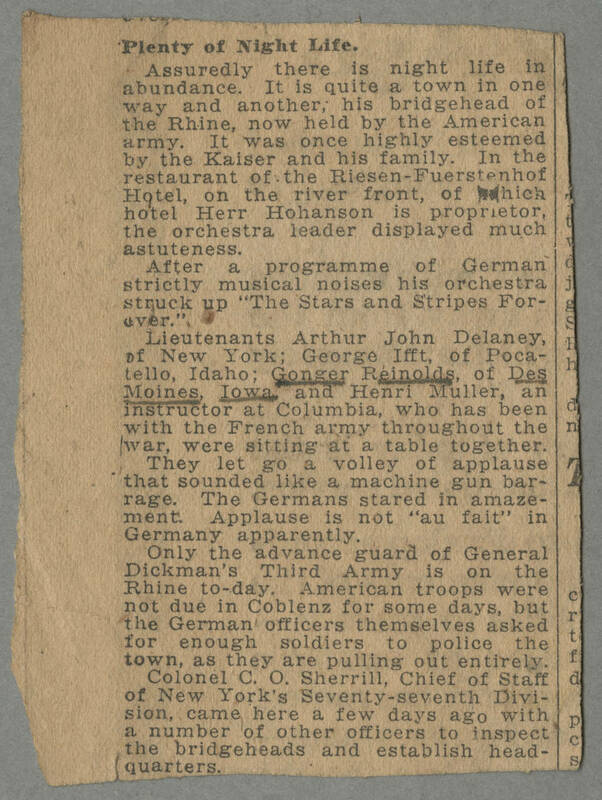 After a programme of German strictly musical noises his orchestra struck up "The Stars and Stripes Forever." Lieutenants Arthur John Delaney, of New York; George Ifft, of Pocatello, Idaho; Gonger Reinolds, of Des Moines, Iowa, and Henri Muller, an instructor at Columbia, who has been with the French army throughout the war, were sitting at a table together. They let fo a volley of applause that sounded like a machine gun barrage. The Germans stared in amazement. Applause is not "au fait" in Germany apparently. Only the advance guard of General Dickman's Third Army is on the Rhine to-day. American troops were not due in Coblenz for some days, but the German officers themselves asked for enough soldiers to police the town, as they are pulling out entirely. Colonel C.O. Sherrill, Chief of Staff of New York's Seventy-seventh Division, came here a few days ago with a number of other officers to inspect the bridgeheads and establish headquarters.